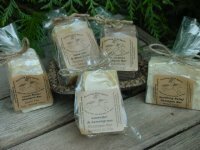 Shampoo bars are perfect when you are traveling and you don't want to worry about shampoo leaking all over. This bar leaves your hair clean and healthy. Travel with it as is, or cut into smaller pieces and make your own travel-size bars to take on the road! Use as a shampoo, body wash, or shaving bar. For the most difficult dandruff and psoriasis on the scalp. Ingredients: calendulated olive oil, castor oil, wheat germ oil, coconut oil, pine tar.